Grew up with Ibon Niksic (Montenegro) juniors. Made his debut with Ibon Niksic, 1B, during the 2008-09 season. Signed for the 2009-10 season by BC Buducnost Podgorica. Loaned to KK Lovcen Cetinje. Back to BC Buducnost for the 2010-11 season. Won the 2014 and 2019 EuroCup with Valencia BC. Named 2013 and 2014 EuroCup Rising Star. Named to the 2016-17 and 2018-19 All-EuroCup First Team. Named to the 2011-12 and 2013-14 All-EuroCup Second Team. Named 2018-19 EuroCup Top 16 MVP. Named 2011-12 EuroCup Quarterfinals game-1 MVP. Named 2013-14 EuroCup Semifinals game-1 MVP. 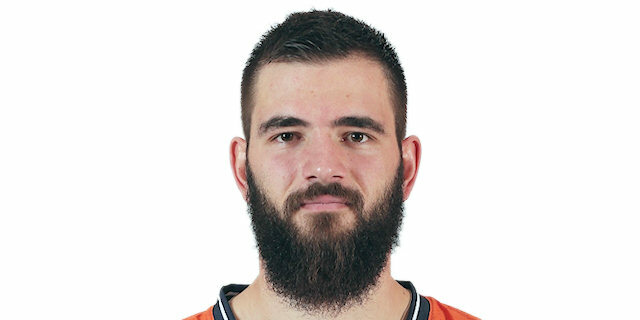 Named 2018-19 EuroCup Top 16 Round 4 MVP. Named 2018-19 EuroCup Finals Game 3 MVP. Named 2016-17 EuroCup Quarterfinals Game 3 MVP. Won the 2010-11 and 2011-12 Montenegrin National Championship with BC Buducnost Podgorica. Won the 2011 and 2012 Montenegrin National Cup with BC Buducnost Podgorica. Won the 2017 Spanish Super Cup with Valencia BC. Has been member of the Montenegrin U-18 and U-20 National Team. Played at the 2008 ad 2009 European ‘B' U-18 Championships.